Ten days before the season-opener, practice slipped. On Wednesday, Nebraska wasn’t up to snuff. Whether that was because it’s the second day of classes or something else, offensive coordinator Troy Walters was not interested in excuses when he met with the media after practice ended. “It wasn’t our standard. We set the standard high and the guys came out and were going through the motions today, so we let them know that,” he said. “Guys just didn’t show up ready to go. That’s a learning experience. We’ll learn from it. Asked if it was the mental or physical lacking in the team’s approach, Walters said he doesn’t separate the two. They go hand-in-hand. If one isn’t on, it impacts the other. That was the case Wednesday. Practice gets taken seriously under head coach Scott Frost and company. At Oregon, Chip Kelly operated under the philosophy that his team would be the best-practicing unit ever. Frost took that approach to Central Florida and he brought it with him to Nebraska. The stretch portion of practice is not a walk-through, it’s something to be attacked. Given the schedule Nebraska faces this season, there’s even more of a desire to consistently bring it on the practice field. “We’ve got to use this as a learning experience, go back and watch the tape and let those guys understand that with the schedule we play, if you come out flat on any given Saturday, it’s going to be a long Saturday,” Walters said. Like when the wrong route gets run or a coverage gets busted, there wasn’t a ton of on-the-fly stopping, coaching and starting again. Walters said the issues that got the better of the team today will get addressed in the film room. “You’ve got to work through it,” Walters said. “In a game, if things don’t go your way you’re not going to be able to stop the game. We let them work through it. Leaders gotta step up and hold guys accountable and call guys out. >> Offensive lineman Jalin Barnett has officially left the Huskers, offensive line coach Greg Austin confirmed Wednesday. >> There has been no concrete decision made on the quarterback race, but the team will hold a situational scrimmage on Thursday in the hopes of aiding that decision. In that scrimmage, Adrian Martinez and Tristan Gebbia will both continue to wear their green practice jerseys; neither will be live. Instead, Walters said they’ll be put into two-minute and four-minute drills as well as red zone and third-down situations. 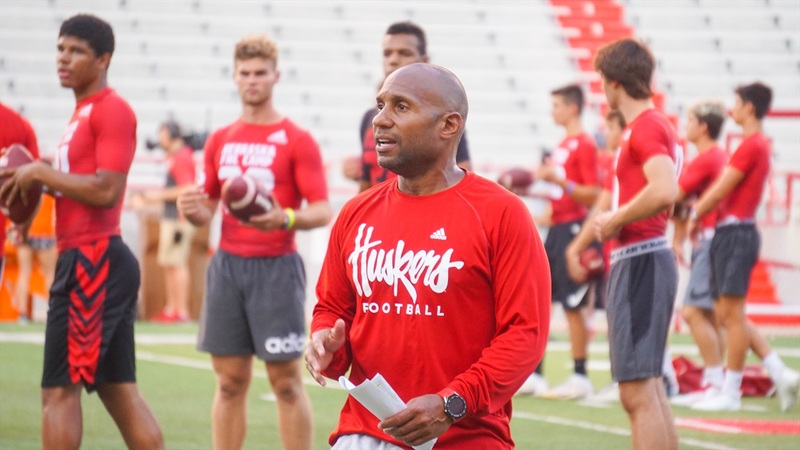 Walters said the entire staff will sit down and discuss the competition; it won’t just be Frost or quarterback coach Mario Verduzco making the call. Verduzco, however, said it’s ultimately up to Frost if they decide to run with both quarterbacks. If that’s the case, Verduzco laid out how he would handle split reps.
“You get them earlier in the game and all that sort of stuff when they're meaningful reps,” he said. “Obviously you're always concerned about whether or not a guy's got some rhythm going. All of those sorts of things that have nothing to do with the Xs and Os and are psychological in nature. Coach Frost is cognizant of that being a quarterback himself. “That'll be something he'll have to decide and how he'll want to piece that together. I'm certain he would let me know and I would let them know to kind of anticipate what the plan might be. As of right now, there's no plan to play two quarterbacks." >> Walters said freshman wideout Andre Hunt is a guy that “has an opportunity to play this year and be in the rotation.” An interesting remark given the depth at the wide receiver position. Walters said Hunt’s biggest strength is his route running. >> Running backs coach Ryan Held said Miles Jones and Wyatt Mazour are two of the primary guys filling the Duck-R spot in the Huskers' offense. He added they have weapons like Tyjon Lindsey and JD Spielman that can rotate in, but Jones and Mazour are the top guys right now. Greg Smith will have more on that later. >> Walters said the running back position will officially go by-committee this season. If that’s news or not. Sophomore Tre Bryant continues to deal with an ankle sprain. >> Wideout Jaevon McQuitty seems to be past any ill-effects of a knee injury that cost him his 2017 season. He said the only time he thinks about the knee is when the media asks him about it.